We never actually referred to Airport Madness: Time Machine as being number 5, but I’m keeping count. Like any software that offers several versions, it’s important to come up with a naming strategy. After all, who’s going to buy Airport Madness 19 ? For that matter, Airport Madness 6 ? The next three versions will be named Airport Madness: World Edition. I haven’t decided which airports to build. I could simply copy Radar Chaos: World Edition’s list of five airports, for sake of consistency. But I won’t, because I don’t believe that these airports would necessarily be fun Madness airports. I like Las Vegas McCarran. 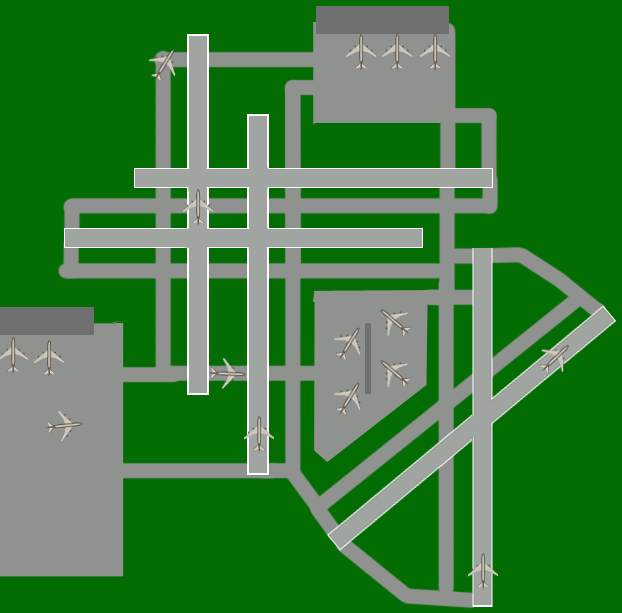 The runway/taxiway layout looks like fun, in terms of conflict points and overall confusion. Plus, it’s Vegas, Baby! I’ve been making games for nearly six years now, and one thing I’ve learned about success in game development is, you’ve got to be lucky. How is it that Airport Madness became as successful as it did, yet my other games fared so poorly in comparison? I read all of my emails, and I take all ideas and suggestions very seriously. I try to give people exactly what they want, when dreaming up my next big game. Seems like Airport Madness is what people are after, so I shall stick to that. Hopefully I don’t exhaust the concept! I’m working on “the look” of Airport Madness: World Edition right now. 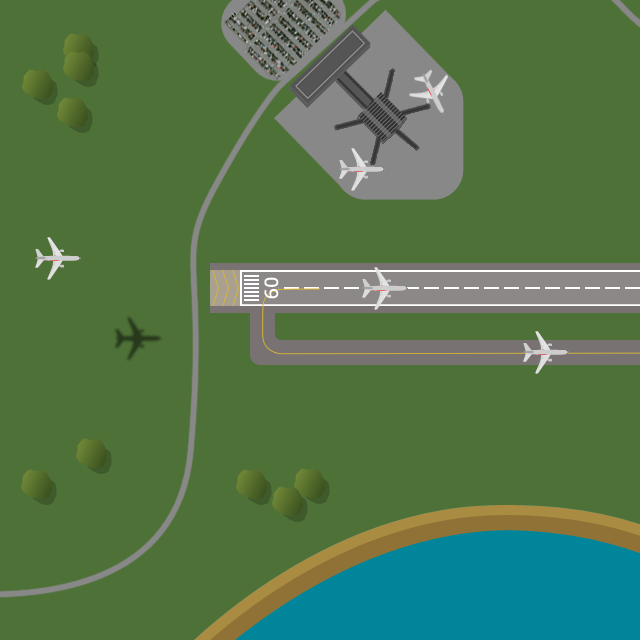 Up until now, each new version of Airport Madness looks more “realistic” than the previous. The very first Airport Madness had flat colors and very simple detail. It was just a simple 640×480 Flash game. Madness 3 offered earth textures. Madness 5 had every detail, right down to the duck pond located behind the unfinished hangar construction. I’ve read emails from people saying, “You should totally use Google Earth for your maps“. Besides the cost of acquiring Google Earth imagery, I don’t believe this would make for fun game play. Each increase in detail reduces a player’s ability to identify airplanes. The game loses it’s contrast, between airplanes and earth. Airport Madness: World Edition art will take a necessary step backward, in an effort to improve game play. I think you’ll like it. Release date? August 29, 2014. Stay tuned! This entry was posted in Airport Madness 6 on June 5, 2014 by admin.